Inc. was awarded a 120-day contract tor the drydocking of the USS Ticonderoga, the Navy's first Aegis Cruiser, presently homeported in Pascagoula, Miss. The vessel's overhaul is being managed by the Supervisor of Shipbuilding, Conver- sion in Pascagoula, Miss, for the Depart- ment of the Navy. Repairs, which are scheduled to begin in February 2002, consist of rudder, shafting, valve, structural and electrical repairs as well as major preservation items that presently total approximately $8 million. Bender has the option pric- ing in place for additional work that could bring the total package to almost $16 million. LV21at the Group's Ramsgate facility. A&P's Ramsgate facility since it opened in 2000. Va. (45 percent), and is to be completed by June 2004. Contract funds will not expire at the end of the current fiscal year. Washington, D.C.. is the contracting activity. USS Gunston Hall (LSD 44). Work includes miscellaneous structur- al, electrical, and mechanical repairs including ship alterations, and alter- ations equivalent to repairs. December 11. The floating drydock, which measures 984 x 2,296 ft. (300 x 700 m) and is capable of lifting 85,000 tons, will be the largest floating dock on the Eastern seaboard of the U.S., accom- modating cruise vessels up to 150,000 grt or VLCC tankers of up to 250,000 tdwt. Suez Canal and then across the Mediter- ranean and the Atlantic. 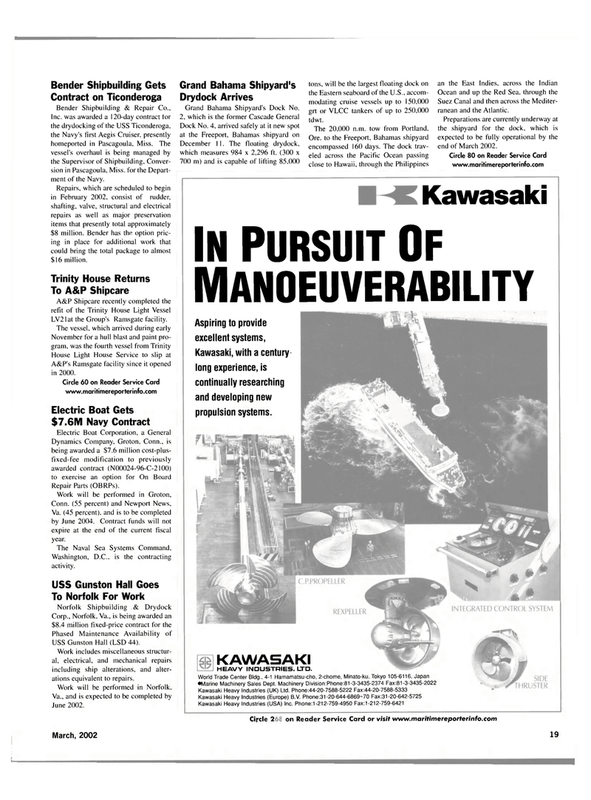 Kawasaki, with a century long experience, is continually researching and developing new propulsion systems.